Bake My Day! 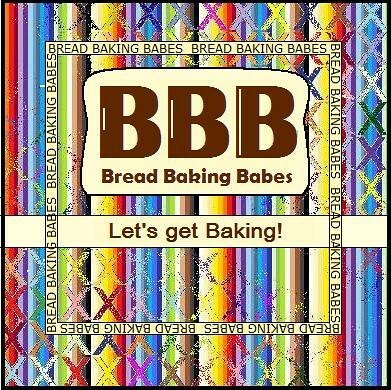 : World Bread Day: Smiling breads are welcome! World Bread Day: Smiling breads are welcome! This brings a smile to your face? 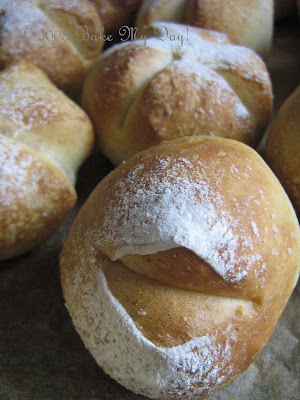 Wait till you see the recipe, easy light whole wheat rolls without the rolling! Made for another World Bread Day, for the 3d time hosted by Zorra at Kochtopf or 1x Umrühren bitte! The announcement was to be found here. This will make a nice, soft and elastic dough, knead by hand or machine for approx. 10 minutes. Cover and let rise until doubled. Pat with your hands or use a roller to form into a 1 cm (3/4") rectangle and use a cookie cutter or a small empty can to cut into rounds. We need defined sharp edges here so we get maximum rise. Depending on size you'll get 15 rolls from 1 recipe. Place on a baking sheet and dust with flour. Cover and let rise for a second time. When fully risen and the rolls are all nice and puffy, get at them with a pair of scissors; use your imagination and snip from four sides, you'll get cloverleaf breads (background top picture). One snip on top will bring some smiles to your rolls. Bake for 6-7 minutes on 210C convection oven, turn rolls upside down and bake the underside for another 5 minutes. Eat, enjoy and have fun! I made these for a party, doubled the quantity dough and got almost 35 tiny rolls, served them with mini hamburgers, lettuce, tomato, red onion and tiny cornichons. Not a difficult dough, no intricate instructions, but when organizing a party and in need for some home-made breadrolls it's nice to have an easy standby. I can always use a warm smile with fresh bread baking! I'll return for the recipe! Hehe, smiling breads are definitely welcome. Too cute. Love it! It's like your auntie's secrete technique that she won't tell and everybody in the family is dying to discover! I'd call this the smiley slash with scissors! I made some changes to the original recipe to make it whole-wheat bread, originally only cheesy bread. The bread was perfect to eat by itself, but I used it to make some chicken sandwiches for lunch Monday, hmmm that was a piece of foodie heaven. I so love the smiling bun concept. Imagine adding some eyes and you've got a party. 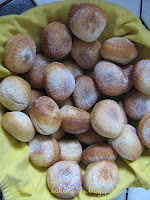 Due to the cool weather here in NL i always had a hard time proving bread dough,do you have any good tip ? *big smile* Love your smiling buns! Thx for your participation in WBD'08. Buns are always better when they are smiling! They look so fun and tasty. I bet your mini burgers were a big hit. Those are hilarious! And they look delicious as well. These rolls sure make me smile! What a great entry!